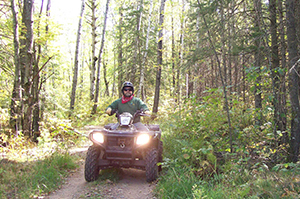 This 18-mile trail in eastern Itasca County follows trails within the George Washington State Forest. Forested areas vary from densely wooded to harvested pine that open to wide views of the surrounding landscape. The trail travels by Hartley, Scooty and Wolf lakes and crosses the west fork of the Prairie River. The trail is provided by Itasca County and maintained by the Balsam Trail Blazers. From Nashwauk, go 18.5 miles north on Hwy. 65. Parking is west of highway.